Nesting Dolls are not just great decorations, or toys, they also have that great balance of charm, and mystery. Most people know what a Nesting Doll is, but they might call it a Matryoshka, Stacking Doll, Russian Doll, Wooden Doll, or even "One of those dolls, you know, the kind that open up, and then there's another one inside, and then another one, and another one." Imagine you tell someone you have a big surprise for them, after their curiosity has been peaked you would hand them a nesting doll. They might be rather confused, not so much as disappointed, but curious as to why you would give them a Nesting Doll, you tell them to open it up. As they cautiously open up the set of dolls, they finally see that surprise you've hidden inside one of the smaller dolls. Tickets to a play? A car key? Maybe even a wedding ring? 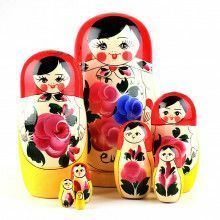 The Nesting Doll originated from sets of stacking boxes, so why not use the charm of a doll, combined with the functionality of a storage device to give them a gift as well as an experience they'll never forget. The memory of their anticipation turning into excitement will be well worth the affordable price of one of our nested dolls. So what are you waiting for, browse through our collection and find the perfect way to show someone you care today. 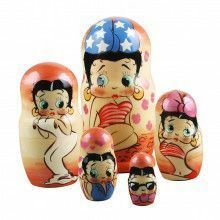 Nesting dolls are a way to explain other cultures to children, or if you're of Russian heritage, a great way to connect your child with their Russian roots. Nesting dolls encourage children to be creative. There's no right or wrong way to play with a Russian nesting doll. Nowadays toys and games come with rule books, and instructions, but these dolls force your children to come up with their own ways to play, helping train the next generation of creative minds. Nesting dolls help with basic problem solving skills. Children need to be able to open the dolls up, and then put them back together, lining up the picture on the bottoms and tops of dolls. This act nurtures your child's visual and spatial intelligence. Counting nesting dolls are great teaching tools, they help with both basic counting, and basic mathematics. Nesting Dolls are affordable! No need to empty your wallet on the latest electronic gizmo! Nesting Dolls are quiet! This one is particular useful for the parent who's at wits end with all the beeping, and sound effects that are inherent in toys today. Finally some peace and quiet! Nesting dolls are fun! We don't know why exactly, but the act of opening up all the dolls, arranging them, and then putting them back inside one another is just fun! Especially when they're colorful. Whether it's the birth, or adoption of a child, the nesting doll is a great symbol of a family getting bigger. It illustrates that although each member of the family is a separate individual, with their own personality, they all share an unbreakable bond as a family unit. 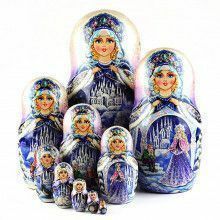 Nothing is more important than family, and there's no better symbol of a family than a Nesting Doll. What better gift to celebrate the start of a new family than with the symbol of a fertility and maternity that is the Russian nesting doll. We feature a large variety of family themed nesting dolls that are sure to bring good luck to any new family. 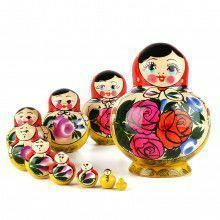 The symbolism of prosperity, and continuity are inherent to the design of the nesting doll, and the happy faces on the series of dolls will show your blessing and wishes for a happy family. Honestly, have you ever seen anything like this in an American home? We never have, but in Russia and the surrounding countries, bottle holders like these are common in homes. People would never guess that the lovely piece of Russian folk art that is sitting on your kitchen counter also contains a bottle of authentic Russian Vodka. Please note that we do not sell any alcohol here at The Russian Store, and the bottle holders will be shipped to you empty. This is the perfect practical and beautiful gift to give to that special someone who seems to have everything under the sun. Some people even go as far as to collect different bottle holders for the different drinks on their bar. Even if you don't drink alcohol, you can still keep a nice bottle of cider, juice, or iced tea handy. Our bottle holders are all one-of-a-kind pieces that are imported directly to us from Russia. Miniature nesting dolls (the smallest ever made at a little over 1" tall) make perfect stocking stuffers at Christmas time, and fun eggs at Easter time! Have you seen our nesting doll pins? They make great add-ons for gifts! How about our Matryoshka doll magnets? Cuter than ever, and an easy gift for those who might be hard to shop for.